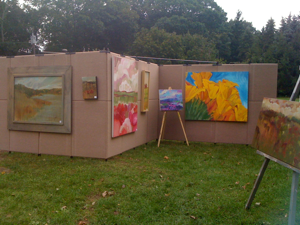 I was invited to participate in the Normandy Manor Design Showhouse with a few other talented local artists. The day was beautiful! More importantly, I was able to meet a few of the decorators and felt instantly connected and understood! The rooms inspired me immediately as they were superbly decorated. I have recently begun painting on un stretched sized/primed linen, so, in the back of my mind, I was thinking about groupings and color themes and how these new pieces would look in frames, but with options for decorators to put their magical finishing skills to work. Needless to say they were well received and I am grateful!